Fig. 15-21. The AE Spacecraft. AE uses a momentum wheel, thrusters, and magnetic coils for attitude or perpendicular to the spin axis. Spin axis coils can be used only for reorientation because torque cannot be applied along the spin axis, whereas a coil with its dipole in the spin plane can provide both reorientation and spin rate control. Electromagnetic control systems vary the control coils' polarity and direction to match the Earth's magnetic field to produce a torque to cause the attitude to change as desired. The Atmospheric Explorer, AE, spacecraft shown in Fig. 15-21, uses magnetic coils both along the spin axis and in the spin plane for attitude stabilization, maneuvering, and momentum wheel control. 1. Anderson, K. A., L. M. Chase, R. P. Lin, J. E. McCoy, and R. E. McGuire, "Subsatellite Measurements of Plasmas and Solar Particles," Apollo 15 Preliminary Science Report, NASA SP-289, 1972. 2. Bracewell, R. N., and O. K. Garriott, Nature, Vol. 182, no. 4638, p. 760-762, 1958. 3. Daugherty, H. J., K. L. Lebsock, and J. J. Rodden, "Attitude Stabilization of Synchronous Communications Satellite Employing Narrow-Beam Antennas," J. Spacecraft, Vol. 8, p. 834-841, 1971. 4. Dunker, C., C. Manders, R. Wetmore, and H. Witting, Orbiting Solar Observa-tory-1 Attitude Prelaunch and Analysis Report, NASA X-581-75-137, GSFC, June 1975. 5. Grell, M. G., M. A. Firestone, M. C. Phenneger, M. E. Pfett, and P. V. Rigterink, Atmosphere Explorer-D and -E Attitude Determination and Control Prelaunch Report Analysis and Operations Plan, Comp. Sc. Corp. CSC/TR-75/6018, Oct. 1975. 6. 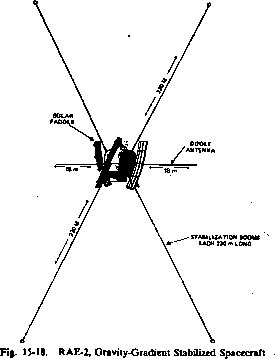 NASA, Mission Operations Plan 1-73 Radio Astronomy Explorer-B, NASA X-513-73-110, GSFC, May 1973. 8. Repass, G. D., J. N. Rowe, V. H. Tate, D. L. Walter, R. J. Wetmore, and R. S. Williams, International Sun-Earth Explorer-A (ISEE-A) Attitude System Functional Specifications and Requirements, Comp. Sc. Corp. CSC/SD-76/6057, Aug. 1975.